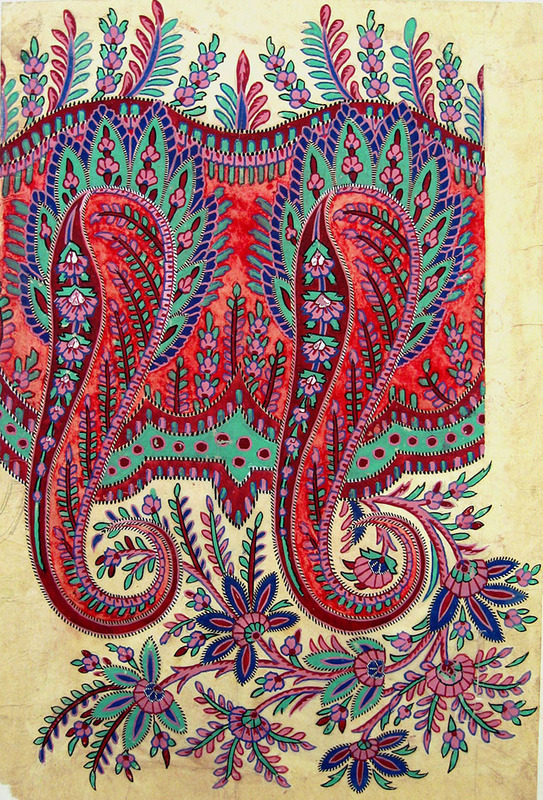 It is quite likely that when I say ‘Paisley Pattern’, many of you will understand and be able to imagine the pattern I am referring to. 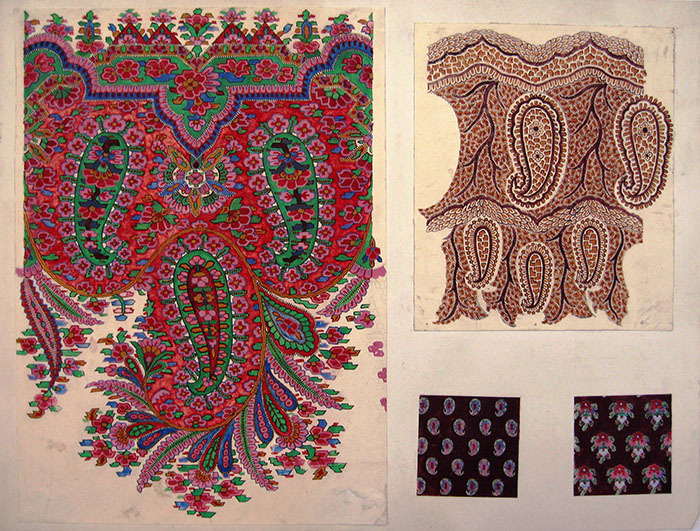 A pattern made up of small symbols perhaps best described as a curved teardrop or maybe a tapered kidney, this pattern has adorned shawls and garments from the 18th century onwards. 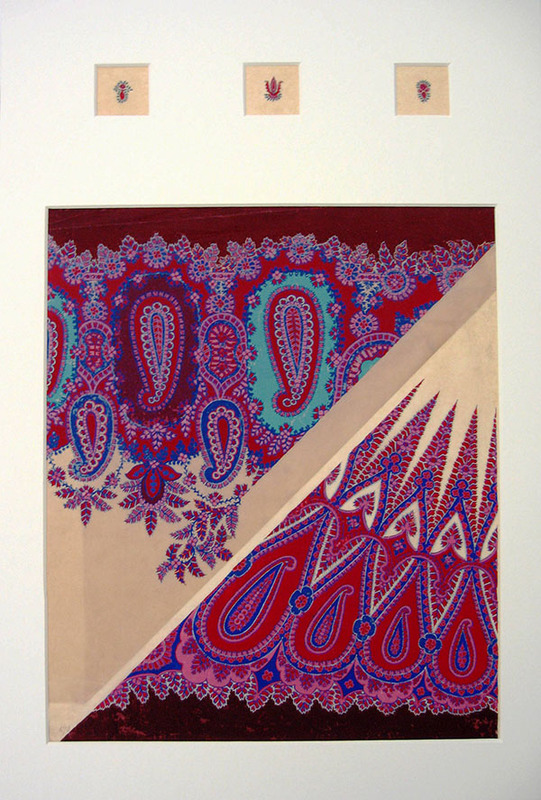 While these shawls with the distinctive teardrop shape originated in Kashmir these patterns eventually adopted the name ‘Paisley’ because of the Scottish town which dominated the shawl making industry. 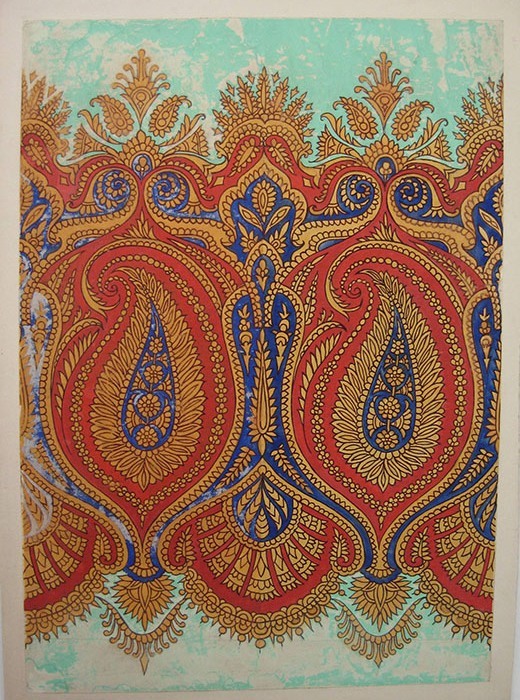 Untitled Paisley Shawl Design, GSA Archives and Collections (archive reference: DC/39/6). Image taken by Kim Grant. To provide a little context it is necessary to go back to the early 18th century when a new garment was beginning to enter the world of fashion, initially in Britain and then travelling to other countries in Europe. The Kashmir shawl had made its debut. A garment made from soft goat’s-down fabric that was richly woven and worn almost exclusively by men – often around the waist in the style of a modern day cumberband – these textiles were prized for their softness and patterned design. These textiles with their exotic patterns and costly softness meant that travellers often purchased these shawls as gifts or souvenirs to bring home. Eventually this resulted in the Kashmir shawl being brought to Europe by the East India Company. 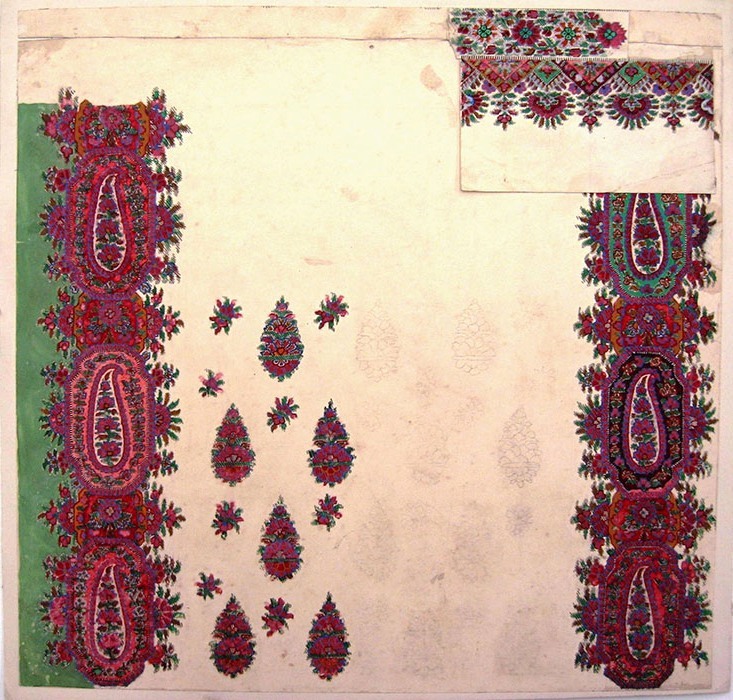 These original Kashmir shawls were rare and highly priced items because of the material they were made from – the wool for these garments was gathered from a Central Asian species of goat that would shed its under-fleece which would then be gathered from rocks and bushes – and the length of time they took to complete. 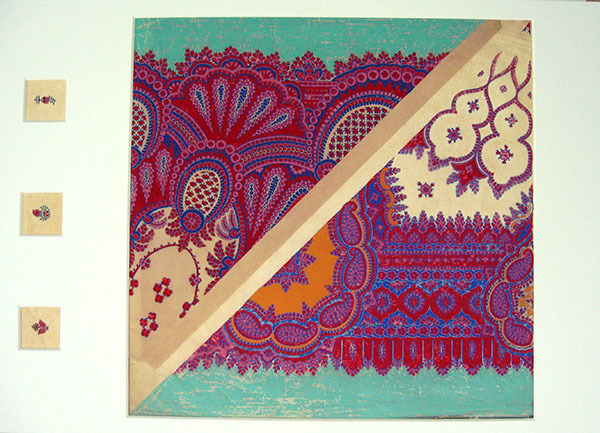 A genuine Kashmir shawl could take the weaver up to two or three years to finish. It was the tremendous cost of these garments, coupled with their desirability that catalysed the creation of an industry that produced shawls in ‘imitation of the Indian’ for a much cheaper price. 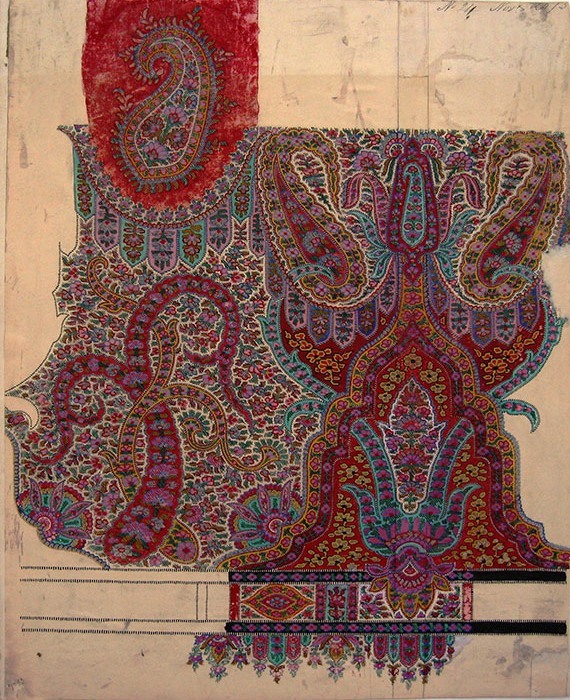 Paisley is the largest town in the historic county of Renfrewshire just outside of Glasgow – which is currently bidding to be the UK City of Culture 2021 – that eventually became known for its production of ‘Paisley Pattern’ shawls because of their sheer dominance in the industry. 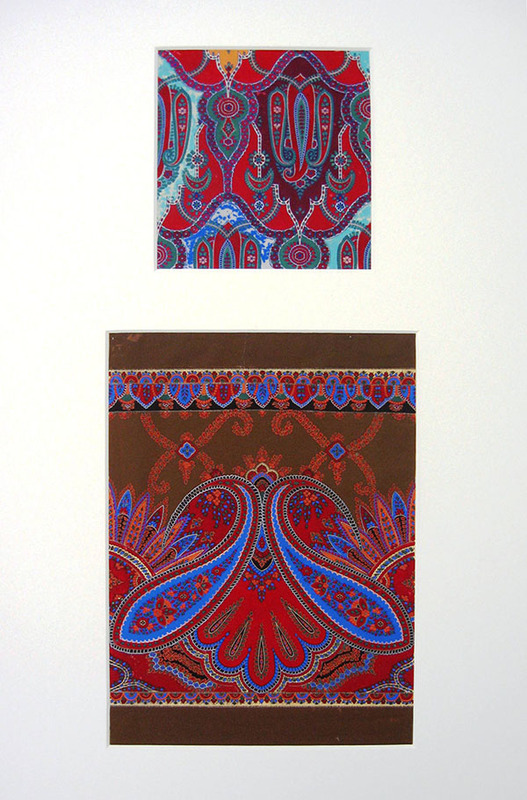 Although these shawls were originally advertised as in ‘imitation of the Indian’ and produced by manufacturers in both Edinburgh and Norwich, Paisley outstripped the competition to the point where the imitated teardrop pattern became synonymous with the town’s name. 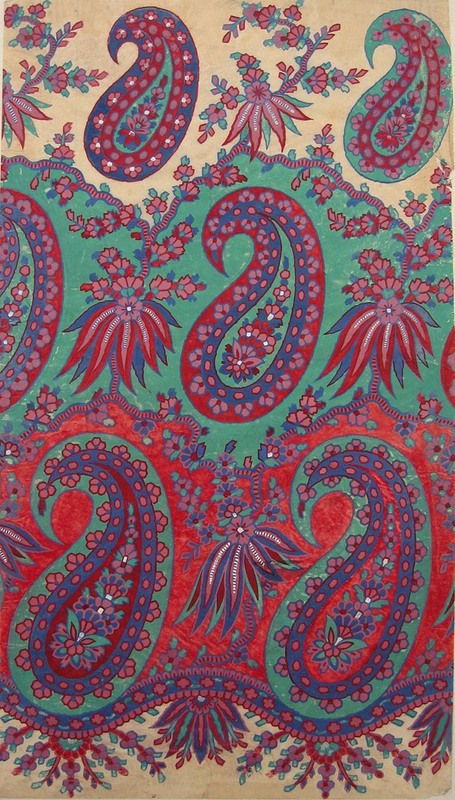 It is thought that Paisley’s pursuit of this industry was so vigorous because of a depression in the late 18th century of their mainstay of silk. This meant a new industry was desperately needed and there were many people ready and eager for the work. 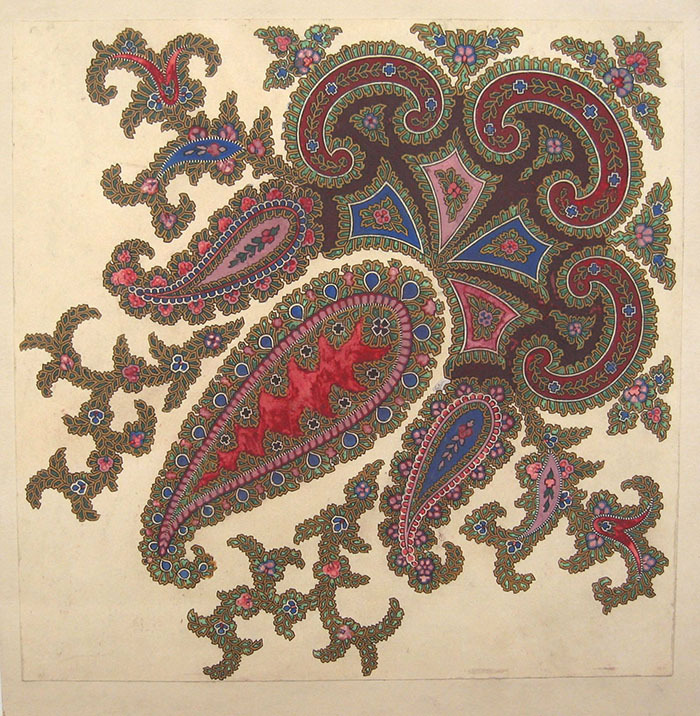 As Paisley dominated the shawl making business it became an almost single industry town and was only able to sustain itself on this industry alone for such an extended period because fashion happened to favour the shawl as an adaptable garment for many outfits. However, when this eventually changed Paisley once again suffered a depression as they were wiped out by the competition. 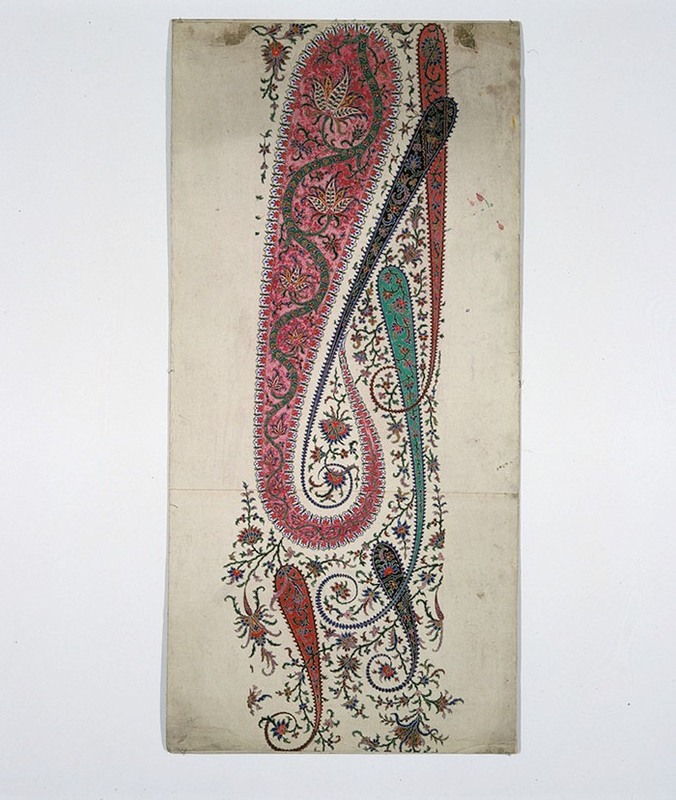 In our Archives and Collections we have a collection of 27 mounted boards with hand-drawn designs for shawls featuring the ‘Paisley Pattern’. 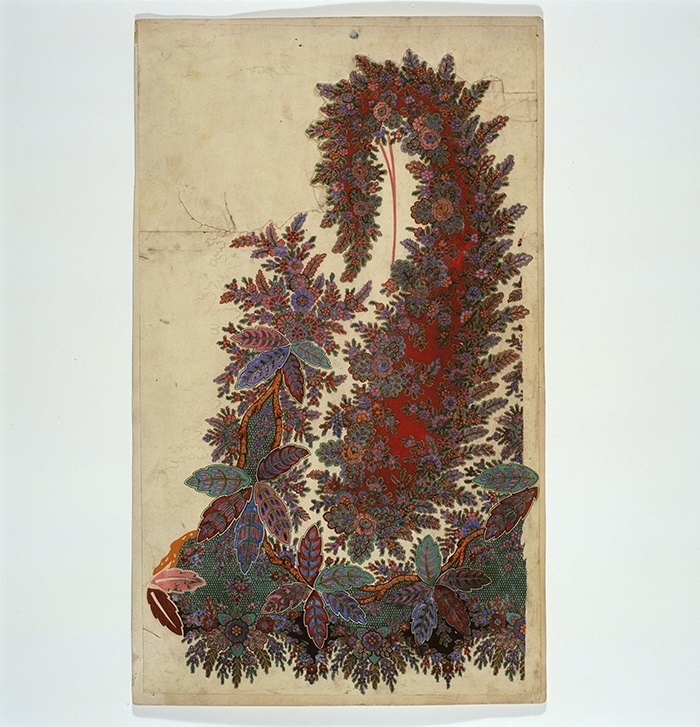 These designs would have been created and then transferred to woodblocks to make printed shawls, rather than woven ones, and were likely created by freelance designers or in-house by a shawl manufacturer for sale. In our archive holdings we have many items that relate to past GSA staff or students as we seek to gather artefacts, artworks and records that will help to track the progress of teaching here at the School. 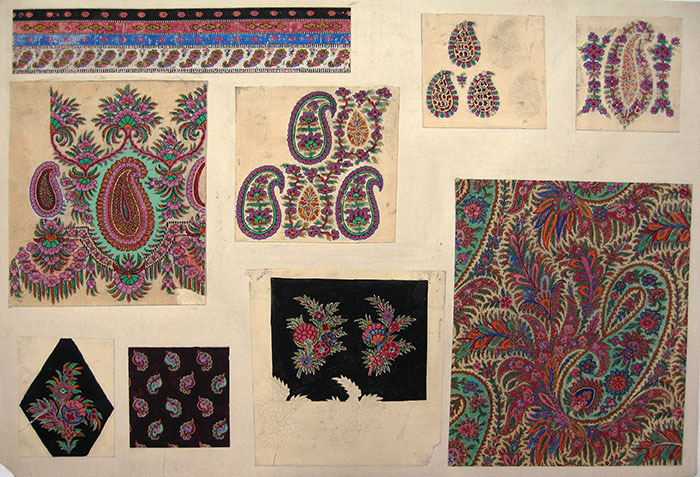 These Paisley patterns came to our collection as a set of teaching aids brought together by GSA lecturer T. C. Campbell Mackie who taught at the School from 1921 to 1950 and became the Head of the Design & Crafts Department from 1932-1945. Unfortunately we do not know who exactly created these designs, although it is quite likely that several people may have worked on them. 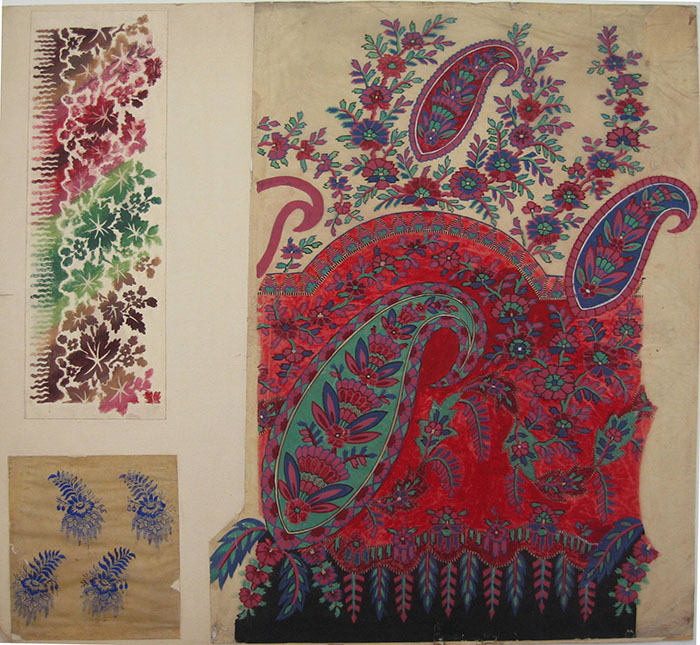 If you would like find out further information about this collection, or if you would like to visit the archive and see any of these designs in person email archives@gsa.ac.uk to arrange a visit. Until next time!